The modern Mantuan school is dominated by the figure of Stefano Scarampella, who rose from railway carpenter to become one of the most influential makers of the late 19th century. Although he took to making relatively late in life, the rugged idiosyncrasies of his work have provided inspiration for over a century. Scarampella’s father, Paolo, is documented as the first violin maker of his family, although no genuine instruments by him are known. Paolo’s elder son, Giuseppe, was an accomplished maker who studied in Paris with Nicolò Bianchi before settling in Florence, where he worked with Luigi Castellini. His instruments vary in model and were probably mostly built as bench copies of the instruments that passed through his workshop. Some are refined and modern, others are antiqued, but all show the range and dynamism of a great maker whose confidence grew from his classical training in the Parisian workshops. The story of Stefano, the younger brother by five years, was very different. Born in Brescia in 1843, he worked first as a carpenter on the Brescia–Mantua railway and it was only after settling in Mantua in 1886 that he became established as a violin maker. His training was almost certainly through his brother, a claim that is stated on his labels and that Stefano used to support his reputation. The relationship between them is also substantiated by their instruments, which are sometimes difficult to distinguish from one another. For the most part, however, Stefano’s output appears to be governed by a philosophy of quick and confident work probably born from his carpentry experience. He was certainly a prolific maker, and estimates suggest that he produced as many as 900 instruments before his death in 1925. His instruments have a characteristic ruggedness, but are solidly and competently made. Scarampella’s wider influences are difficult to pinpoint. His labels identify him as coming from Brescia, as if to assert that he belonged to a different tradition from that of Mantua. The classical Mantuan school of Camillo Camilli and Tomaso Balestrieri had come to an end in 1840 with the death of Giuseppe Dall’Aglio, the last significant maker in the city. Nevertheless, Scarampella appears to have been influenced by Balestrieri’s work, particularly his large-bodied, ‘del Gesù’-inspired model with a powerful, flat arching, very similar to Paganini’s ‘Cannone’ Guarneri of 1743. The 1905 violin featured here is an example of this. 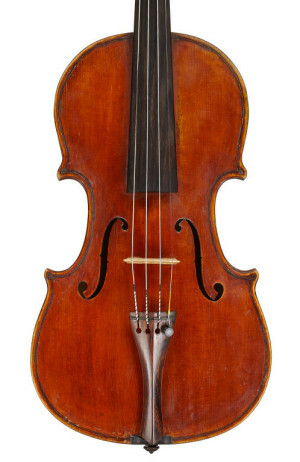 Much of the individuality of this model comes from Scarampella’s observation of Balestrieri’s work, from the rich red varnish to the slightly narrow cut of the soundholes and the faintly conical carving of the scroll. 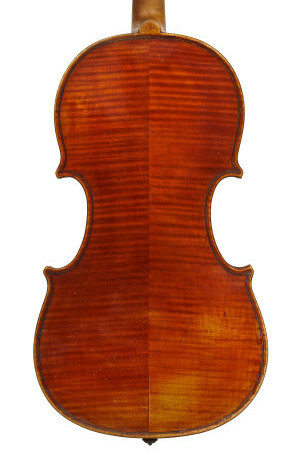 The clumsy purfling, the shallowness and poor definition of the edges, and the abundant tool marks on the scroll all add to its charm, and although these do not have any direct relationship to del Gesù’s working methods, the violin captures the spirit of Guarneri better than the intermediary examples by Balestrieri. In his lifetime Scarampella’s work was hugely respected. His rugged finish and use of a rich, matt varnish provided an illusion of age that lay between the highly antiqued instruments being made by the Bisiach workshop in Milan and his brother in Florence, and the unashamedly new look of violins by the likes of Annibale Fagnola in Turin. The ruggedness itself is largely superficial, for there is no sense of economy in terms of the vital aspects of his instruments. The interiors of his violins are superbly clean, although his failure to inset the linings into the corner blocks reflects his aversion to unnecessarily time-consuming processes, and overall his instruments reveal a high quality of work where it matters most. Even the scroll, which seems on first glance to reveal the limitations of his style, shows the confident, precise hand of a master craftsman. Scarampella’s influence can be seen in multiple generations of Mantuan makers, including Oreste Martini and the Gaddas, whose work will be examined in Part II.